Being Filipino, I can't get enough Asian cuisine. I'm lucky because my parents are currently from Philippines and have been spoiling us with the food I grew up with and love. Speaking of which, growing up, I learned about Asian ingredients early on since my parents were active caterers. About half of the basement in the home I grew up in was a pantry full of ingredients, catering equipment and supplies. It was set up like a mini grocery store, making it easy for my parents to ask my siblings and I to run down and get ingredients as they needed. They bought in bulk and I especially enjoyed stocking up the shelves and organizing the sections whenever they did their big grocery shopping trips. In doing all this for years as a child, one brand that was commonly seen on our pantry shelves and a brand I have used often is Lee Kum Kee. My parents are loyal to this brand because they have a quality product line that my parents still continue to use to this day. Like my parents, I also think highly of this brand and my own pantry is stocked with Asian ingredient staples made by Lee Kum Kee. 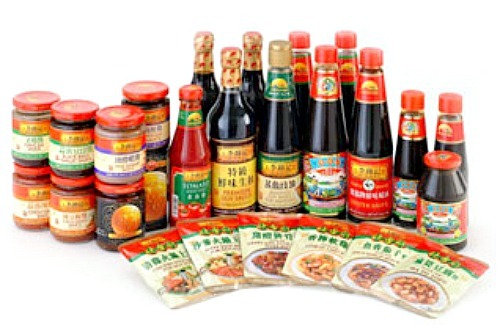 My favorite product is their Oyster Sauce, which happens to be their signature product. When Lee Kum Kee contacted me to partner up in highlighting some recipes and items from their product line, I was thrilled! 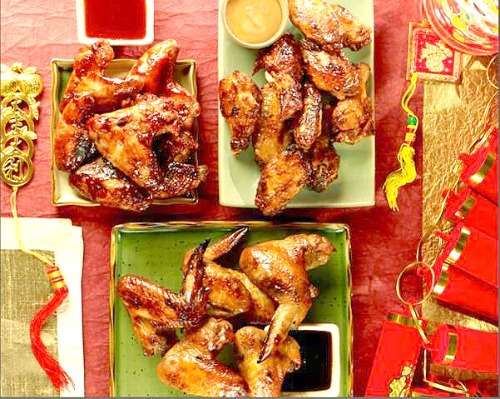 It came at a perfect time since what better way to share recipes during Chinese New Year than with authentic ingredients perfect in making Chinese and Chinese inspired cuisine?! These chicken wings are great can be made with readily available ingredients at your local supermarket. Be sure to look for Lee Kum Kee brand products to get the best results! In a large bowl, whisk together the ingredients in either 1 of the 3 different marinades (or simply use 3 types of marinades for a combo of varieties). Add the chicken wings and toss to coat. Transfer marinade and chicken into a gallon sized storage bag and seal. Chill in the refrigerator for at least 2 hours or overnight. Preheat oven to 450 degrees for 10 minutes. Discard marinade and place the marinated wings onto a baking sheet. Bake in the preheated oven for 30 minutes. Remove from oven and serve hot. These chicken wings look so amazing! Need to see if I have any oyster sauce. We just had another round of snow so I can't go grab any. Is there a similar tasting substitute for it?